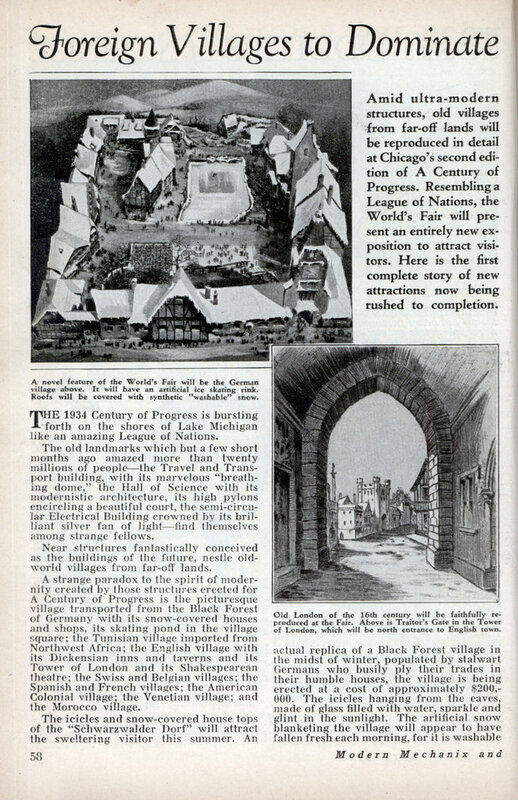 Amid ultra-modern structures, old villages from far-off lands will be reproduced in detail at Chicago’s second edition of A Century of Progress, Resembling a League of Nations, the World’s Fair will present an entirely new exposition to attract visitors. Here is the first complete story of new attractions now being rushed to completion. 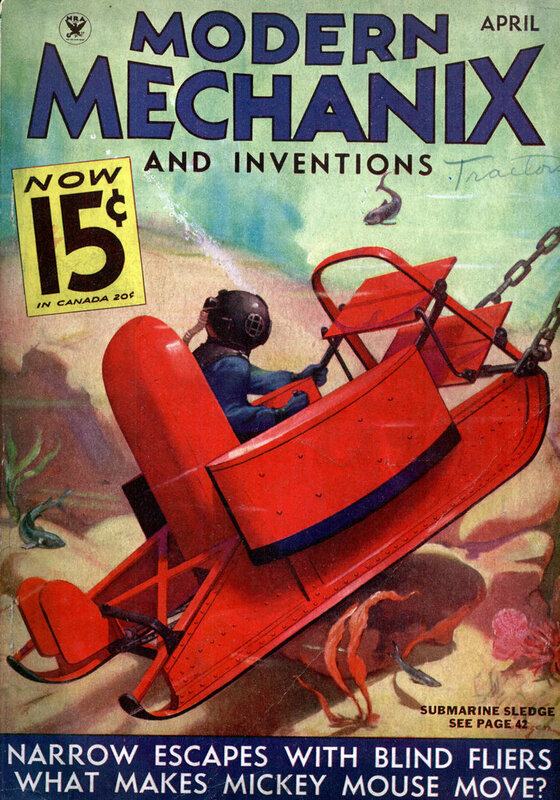 THE 1934 Century of Progress is bursting forth on the shores of Lake Michigan like an amazing League of Nations. The old landmarks which but a few short months ago amazed more than twenty millions of peopleâ€”the Travel and Transport building, with its marvelous “breathing dome,” the Hall of Science with its modernistic architecture, its high pylons encircling a beautiful court, the semi-circular Electrical Building crowned by its brilliant silver fan of lightâ€”find themselves among strange fellows. Near structures fantastically conceived as the buildings of the future, nestle old-world villages from far-off lands. A strange paradox to the spirit of modernity created by those structures erected for A Century of Progress is the picturesque village transported from the Black Forest of Germany with its snow-covered houses and shops, its skating pond in the village square; the Tunisian village imported from Northwest Africa; the English village with its Dickensian inns and taverns and its Tower of London and its Shakespearean theatre; the Swiss and Belgian villages; the Spanish and French villages; the American Colonial village; the Venetian village; and the Morocco village. The icicles and snow-covered house tops of the “Schwarzwalder Dorf” will attract the sweltering visitor this summer. An actual replica of a Black Forest village in the midst of winter, populated by stalwart Germans who busily ply their trades in their humble houses, the village is being erected at a cost of approximately $200,-000. The icicles hanging from the eaves, made of glass filled with water, sparkle and glint in the sunlight. The artificial snow blanketing the village will appear to have fallen fresh each morning, for it is washable and will be “laundered” each night. Â¦ The snow is made of plaster and paint and ground quartz. Thirty-five buildings surround the out-door skating pond, kept “skate-able” by the usual means of artificial refrigeration. It is possible, however, that the pond may be composed of a new “chemical ice,” secretly developed in Germany. If the chemical ice is found to be satisfactory, the directors of the village plan to utilize it for a toboggan slide also. The visitor may also go skiing, if so inclined, on a “chemical snow,” also secretly developed in Germany. In the ancient houses the visitor can watch a peasant artisan at work making cuckoo clocks, a brawny blacksmith at his forge, or a comely fraulein busily manufacturing Kirsch. From Merrie England comes the inspiration for a village literally cluttered with literary history. A faithful replica of the historical Tower of London, will dominate this reproduction of a 16th century old English village. There one can browse in the Old Curiosity Shop made famous by Charles Dickens, attend a performance of Hamlet in Shakespeare’s Globe Theatre in Cheapside, London, or, perhaps, dine in the Cheshire Cheese Inn, in Fleet Street, London, the gathering place made famous by Oliver Goldsmith, Samuel Johnson, Boswell, and the other literary figures of English letters. Sulgrave Manor, the ancestral home of George Washington in Nottinghamshire, will be faithfully copied, as will Stoke Poges church, where Gray paused and mused and composed his immortal “Elegy Written in a Country Churchyard.” The village occupies almost two acres and is being erected at a cost of more than $200,000. The structures will be furnished with exact replicas of furniture of the period, and in many cases with the original furnishings, loaned by the British Government and by English collectors. The buildings were constructed, as are most of the buildings in the various villages, from plaster casts of the originals. From the English village, the visitor can go to the plaza of the acacia-shaded Spanish village where black-eyed Senoritas promenade. This $300,000 village will have replicas of the most famous edifices of 16th, 17th and 18th century Spain. The shrine of the Virgin of Pilar, the original of which is located at Poblet, Spain, is the “centerpiece” of the village. At one side of the plaza is a section of a bull ring where visitors may watch toreadors and picadors. The sponsors are trying to secure permission to stage bull fights. Plans for the Venetian Village call for a reproduction of the Grand Canal of Venice, with sweet-voiced gondoliers manning sweeps and gliding their crafts through the canals which wind between the mansions of the Venetian Doges. The Tunisian village will be a reproduction of a hamlet in the French protectorate in Northwest Africa, the Land of the Bedouins. The crooked streets, lined with “Souks” or native stores, wind their way to the center of the village where the mosque with its minaret and dome towers over the walled settlement. Veiled Bedouin beauties and a company of Tunisian soldiers, loaned by the government of Tunis, and twelve families of native Bedouins will inhabit the village. Just south of the Chinese building loom the snowy peaks of the Alps. And at their base nestles “la Suisse Pittoresque” â€” Picturesque Switzerland. The Swiss village is a reproduction of portions of the city of Berne, the tiny republic’s ancient capital. The Belgian village, one of the most popular of the 1933 exhibits, will be flanked by an American Colonial village which will recall Revolutionary days in this World’s Fair of foreign villages. Here is what the finished exposition looked like http://www.cityclicker….